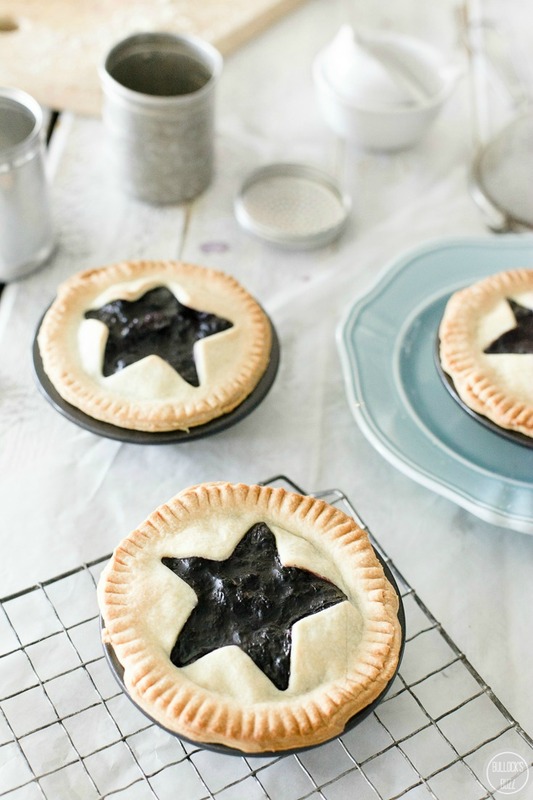 With their cute star cut-outs & fresh blueberry filling these made-from-scratch mini blueberry pies are ideal for your patriotic or summer celebration! Memorial Day is just days away! Of course, Memorial Day is all about honoring the men and women who have given their lives to defend the freedoms of America. In addition to being a solemn time, it’s also a time to celebrate the unofficial beginning of Summer and the wonderful seasonal traditions these brave people protected. 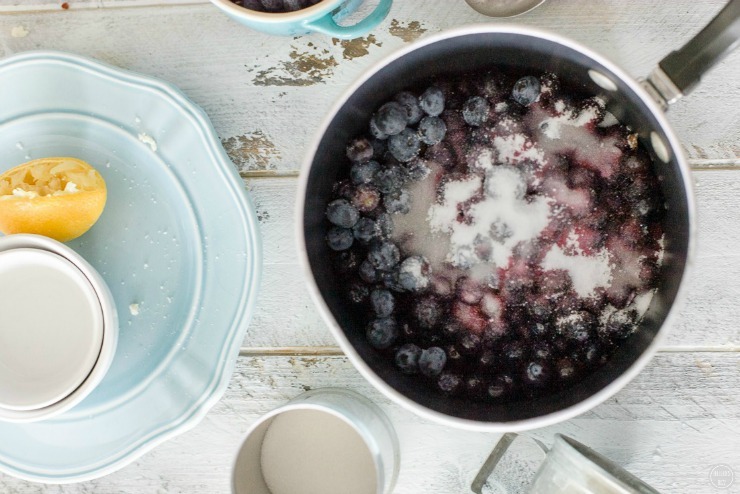 One key tradition is Summer berries and baking pies galore. 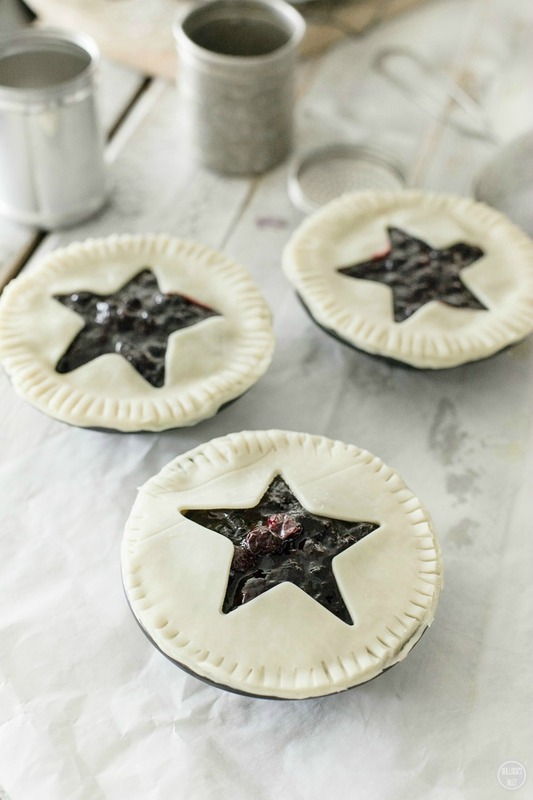 This beautiful patriotic mini blueberry pies recipe takes advantage of blueberry season starting with a yummy homemade filling and a star cutout in the pastry lid! They’ll be the star of your BBQ on Monday and at any other summer celebration. Plus, they not only taste great, they make a wonderful addition to your patriotic decor, too! This made-from-scratch recipe is a little more work than just throwing together some frozen pastry and a can of blueberry filling, but it is absolutely worth it! Once you’ve tasted the delicious, flaky all-butter crust and the dense, preserve-like blueberry filling you’ll never take pie shortcuts again! And as always, there’s an easy-peasy printable version of this recipe at the end of the post. Happy Baking! 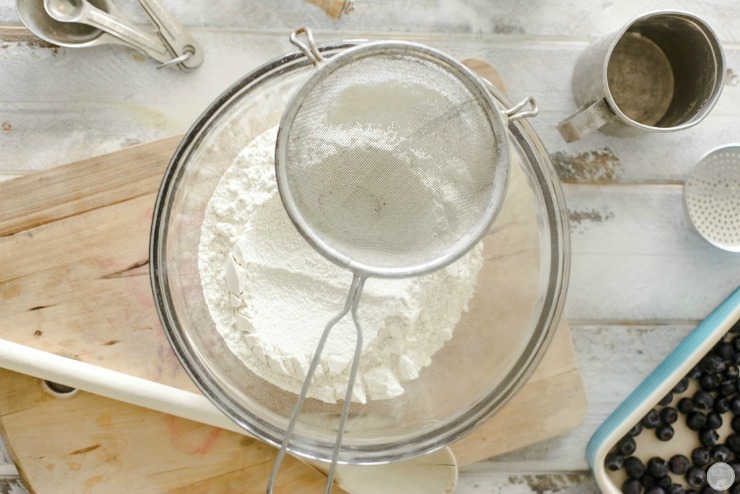 Begin by sifting flour into a bowl and thoroughly the stir in sugar and salt. Next, cut the butter into ½ inch cubes. 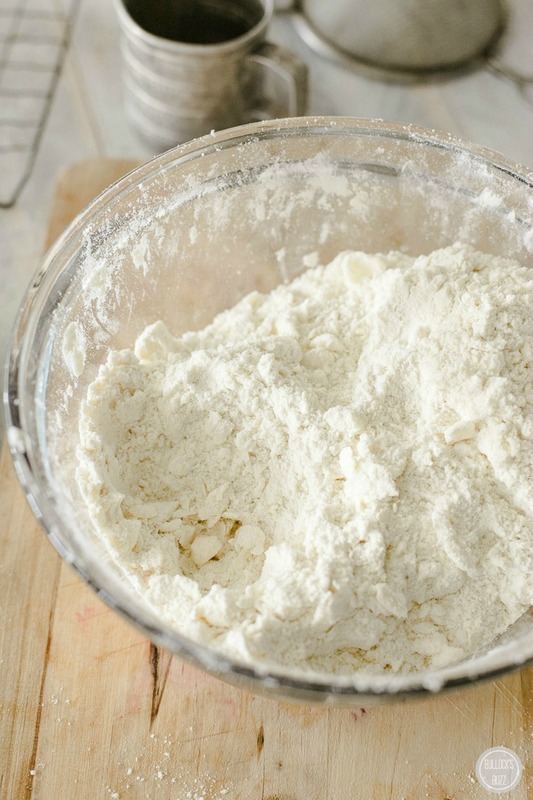 Put the butter into the flour bowl and set into the fridge to cool down for 10 minutes. Once cooled, cut the butter through the flour mixture with your fingers or a pastry cutter (I use a bit of both) until you have worked the butter through the flour. Contrary to what you see in many recipes, you do not want a uniform sandy texture. The butter should be thoroughly cut through, but the size can vary, being up to as large as a pea. Next, create a well in the flour and butter mixture. Take the iced water and pour it into the well, slowly bringing the dough together until it is all moist (not wet). You’re not looking for a smooth texture, shaggy is fine. 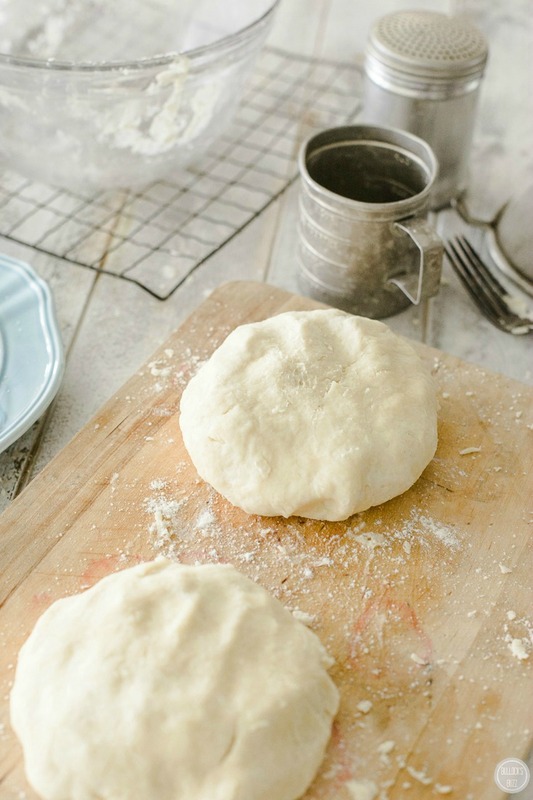 Divide the dough and lightly knead until it is smoother and then press into a disk, wrap in plastic and place in the fridge for at least an hour. While the pastry rests, take the filling ingredients except for the cornstarch and boiling water. Cook the ingredients over low heat until combined. 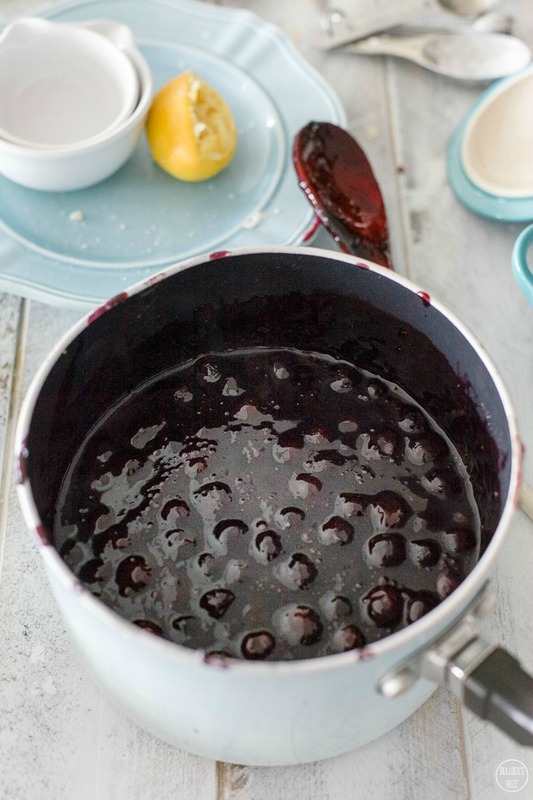 Now dissolve the cornstarch in a small amount of boiling water until it is completely dissolved, pour it into the blueberry mixture and stir thoroughly. Allow it to cook over medium heat until the mixture begins to thicken. Once it begins to thicken, turn down the stove to medium heat until the filling has reduced and thickened to a heavy preserve texture. Set filling aside. Preheat oven to 375° F. Take the dough disks and place on a sheet of parchment paper. Roll the dough a little and then place another sheet of parchment paper on top. Continue rolling out your dough until it is about ⅛ inch thick. Next, use your miniature pie pans and cut out an extra ½ inch around them in order to get your pie bases. Roll out a second disc of pastry and cut circles around the miniature pie pans, but do not leave extra edge this time. 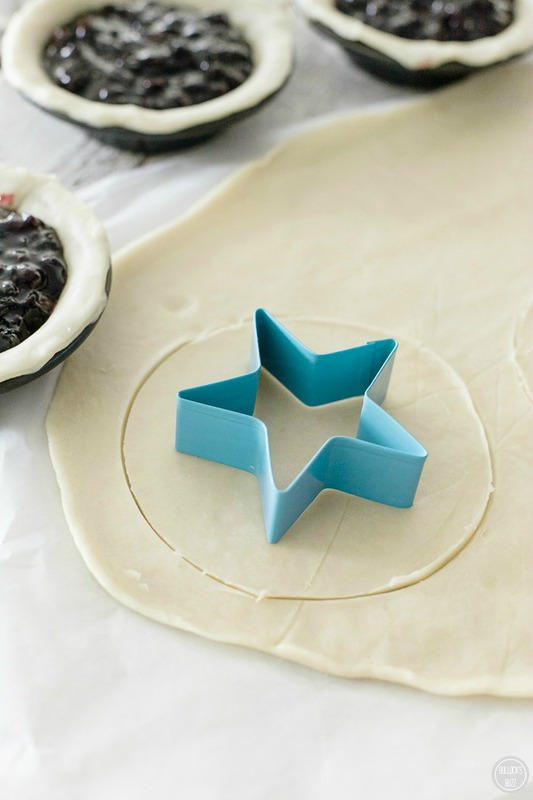 Instead, cut star shapes out of the middle of the ‘lids’. Now press the bases into miniature pie tins and dock any extra overhanging dough. Then fill them with blueberry preserves. 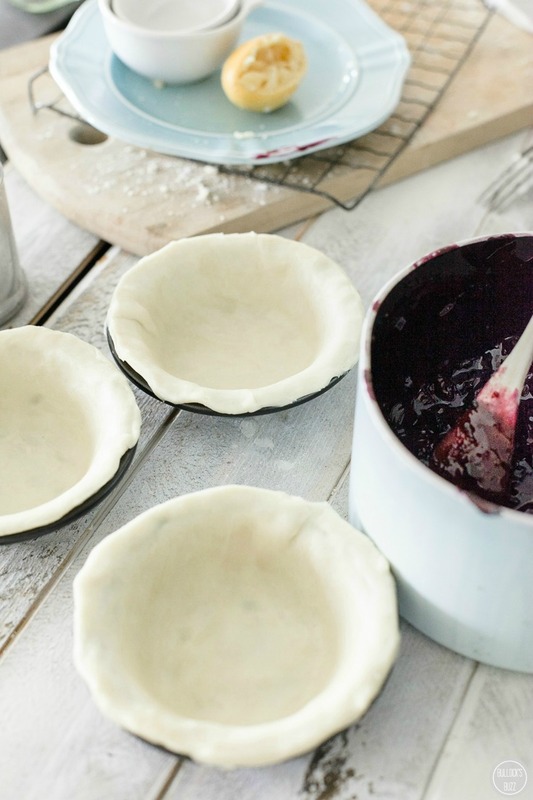 Brush the edges of the pies with egg wash and then place lids on the top of the mini blueberry pies. Crimp the edges with a fork. Give them one more brush across the top of the pastries with egg wash, and then place the mini blueberry pies into the preheated oven. Bake for 35-45 minutes at 375°F until the pastry is golden and the filling looks set. Allow to cool in pan for ten minutes and then either serve immediately with whipped cream or allow to cool on a wire rack. Serve and enjoy! 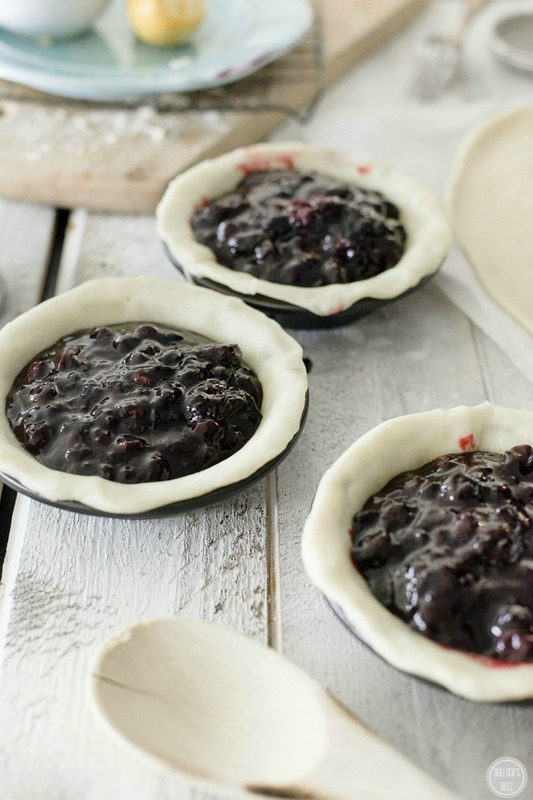 Tip: these mini blueberry pies can easily be made 1-2 days ahead of your summer celebration. Looking for more patriotic recipes for your Memorial Day or 4th of July celebration? These Patriotic Star Sugar Cookies not only taste amazing, they’ll look great on your table, too! 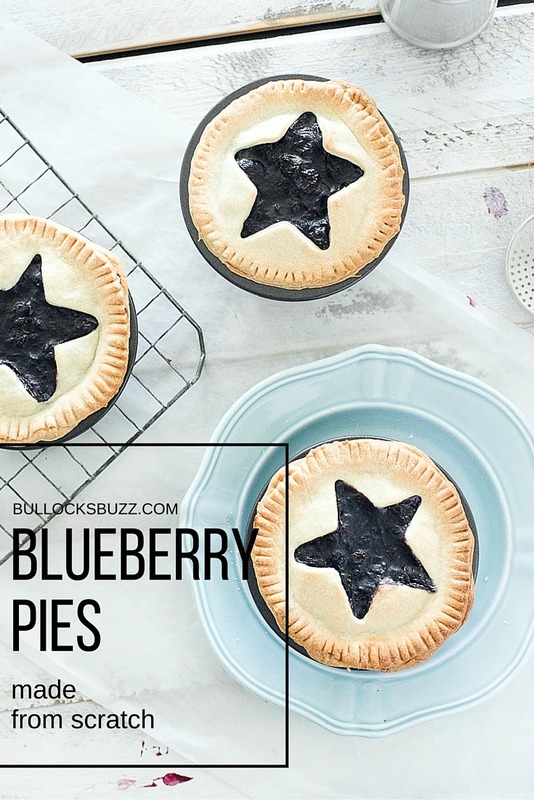 With their cute star cutouts and fresh blueberries these made-from-scratch mini blueberry pies are perfect for your Memorial Day, 4th of July or any other summer celebration! Sift flour into bowl and stir in sugar and salt. 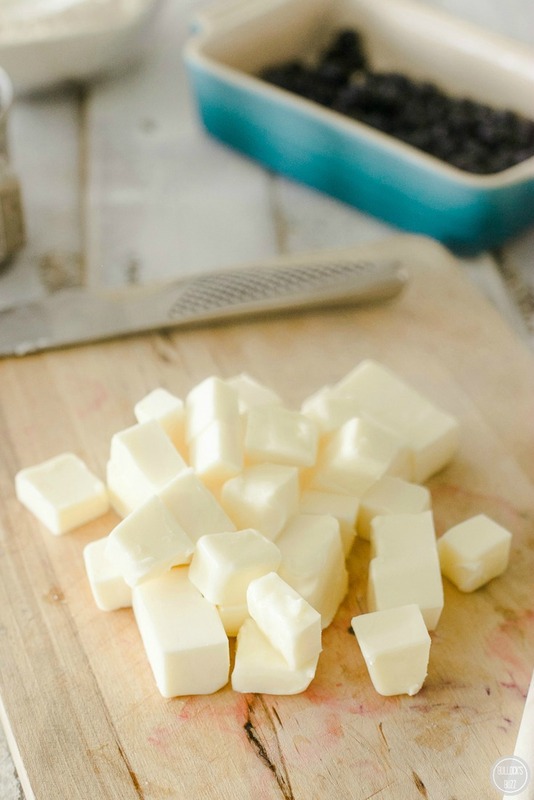 Cut butter into ½ inch cubes. Put butter into flour bowl and set into fridge to cool down for 10 minutes. 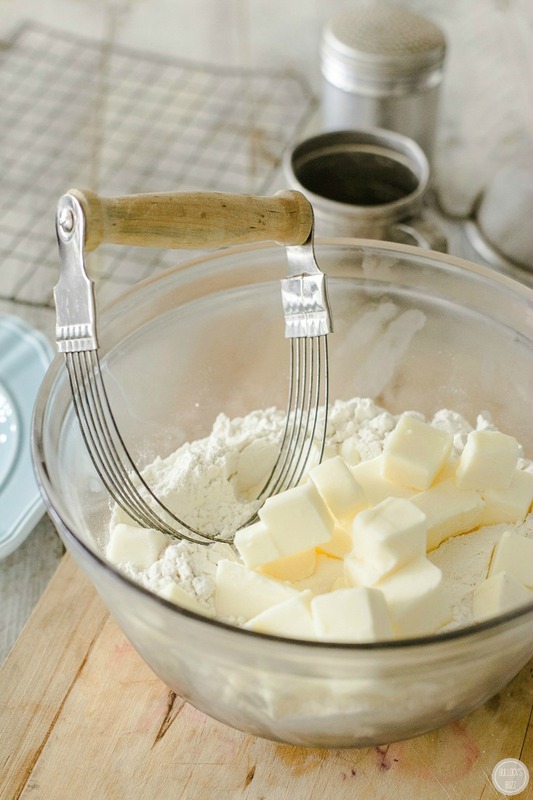 Cut butter through flour with your fingers or a pastry cutter (I use a bit of both) until you have worked the butter through the flour. Contrary to what you see in many recipes, you do not want a uniform sandy texture. The butter should be thoroughly cut through but the size can vary, being as large as a pea. 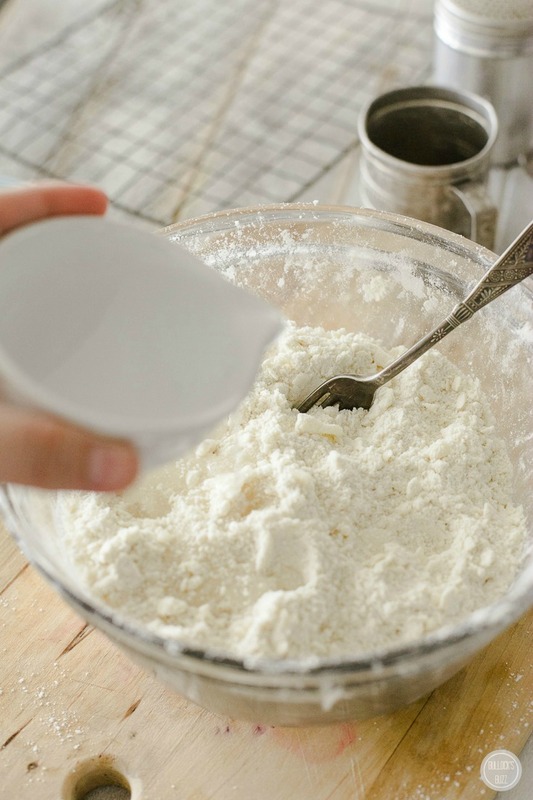 Create a well in the flour and butter mixture. Take the iced water and pour into the well, slowly bringing the dough together until it is all moist (not wet). You’re not looking for a smooth texture, shaggy is fine. While the pastry rests, take the filling ingredients except cornstarch and boiling water. Cook over low heat until combined. Dissolve cornstarch in a small amount of boiling water until dissolved. Pour into blueberry mixture and stir thoroughly. Allow to cook over medium heat until the mixture begins to thicken. Once beginning to thicken, turn down to medium heat until the filling has reduced and thickened to a heavy preserve texture. Take the dough disks and place on a sheet of parchment paper. Roll the dough a little and then place another sheet of parchment paper on top. 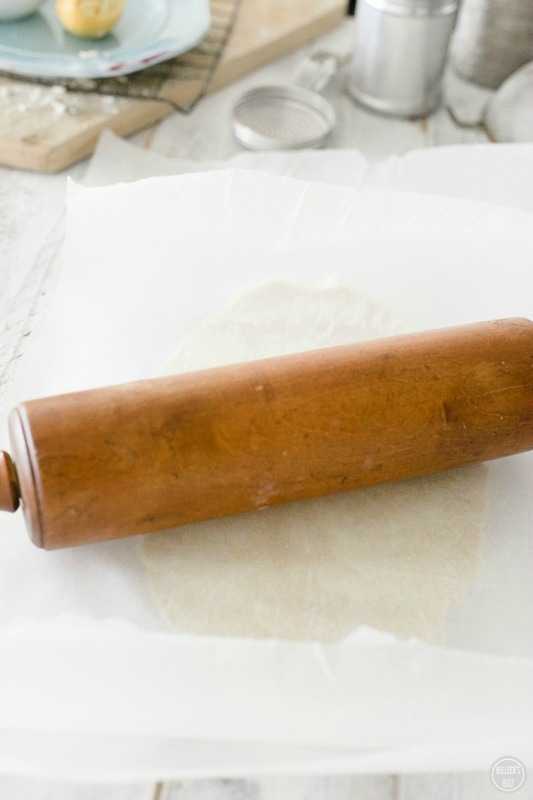 Roll out your dough until it is about ⅛ inch thick. 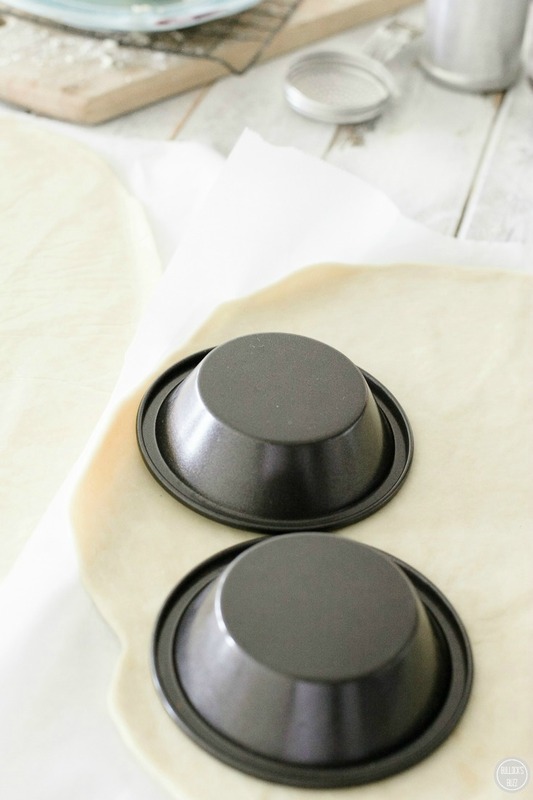 Use your miniature pie pans and cut out an extra ½ inch around them to get your pie bases. Roll out second disc of pastry and cut circles around the miniature pie pans, do not leave extra edge this time. Cut star shapes out of the middle of the ‘lids’. Press bases into miniature pie tins and dock any extra overhanging dough. Brush edges of pie with egg wash and then place lids on the top of the pie. Crimp edges with a fork. Bake for 35-45m at 375F until the pastry is golden and the filling looks set. Allow to cool in pan for ten minutes and then either serve immediately with whipped cream or allow to cool on a wire rack. 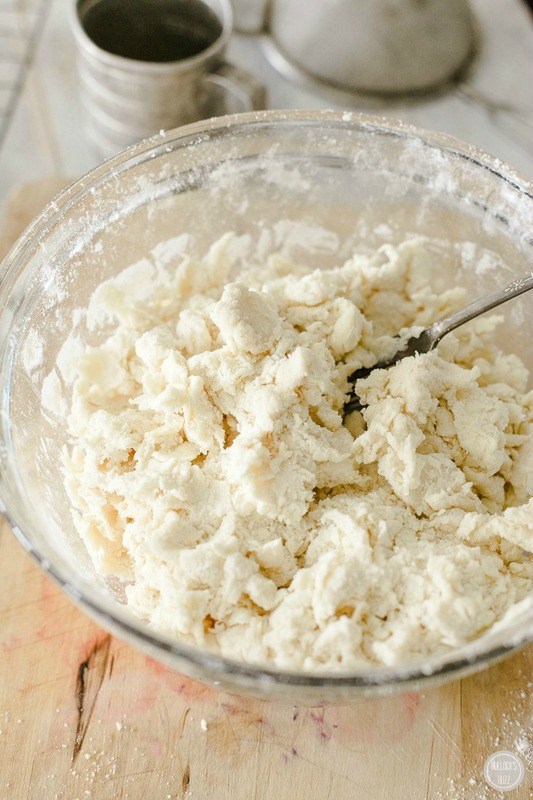 The prep time includes the hour that the dough will be in the refrigerator. This recipe can be made 1-2 days ahead.